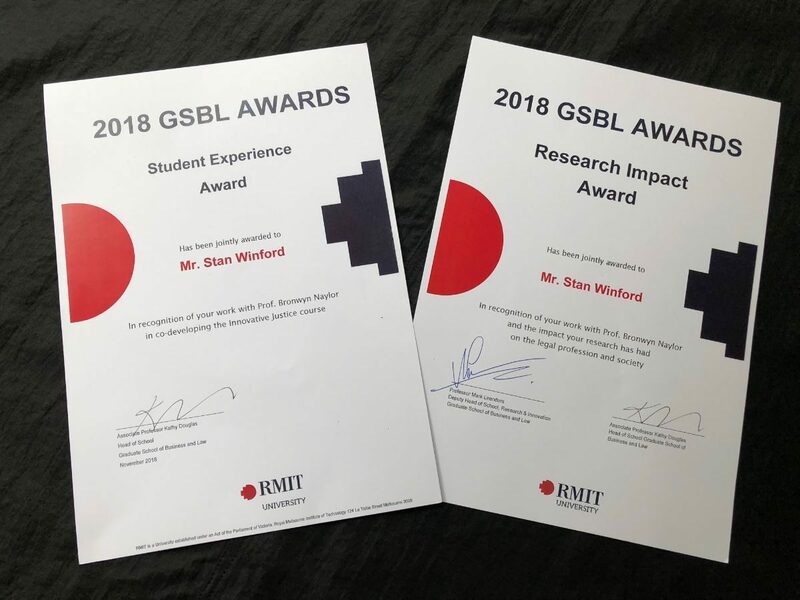 Stan Winford and Bronwyn Naylor jointly received two awards, one for 'Research for Impact' in relation to their work with Woor Dungin on the Criminal Record Discrimination and the other for developing and teaching the course Innovative Justice during 2018. Innovative Justice is taught as one of the mandatory or ‘core’ units in the Juris Doctor (JD) program at the Graduate School of Business and Law, RMIT University. The course is taught across a full semester. It was taught for the first time in 2018, and has now been taught for two semesters. The co-ordinating teachers have been Professor Bronwyn Naylor and Stan Winford, both lawyers. Other legal colleagues have also contributed to the teaching. The course draws on a range of experts working in innovative areas including those involved in running restorative justice programs, teaching ADR skills, and judges/magistrates providing Therapeutic Jurisprudence-style judicial decision making (including Magistrate Pauline Spencer). The importance of multidisciplinary practice is demonstrated in presentations by Anna Howard and Kat Ogilvie, the lawyer and social worker who together which provide clinical placements to RMIT JD students with the Mental Health Legal Centre. TJ provides the overarching framework for the course, with coverage of restorative justice, preventive law, creative problem solving and holistic approaches to law being located within that framework, together with practical applications such as ADR and, problem-solving courts. Students engage with the theoretical perspectives, and apply these in experiential weekend workshops to propose solutions to a range of social justice issues.